A town, two Sikhs, and a Catholic: Pavitpaul Singh, Nikolas Garcia and Jashanpreet Singh stand outside of Southwest Ranches town hall after meeting to discuss the Unity in Diversity 5K race. SOUTHWEST RANCHES | Over 8,000 miles away from New Zealand, where an Australian man killed 50 people in two mosques and injured several others, two young Sikhs and a Catholic walked into a town hall meeting ready to show that regardless of race, faith, and culture, their community is united. 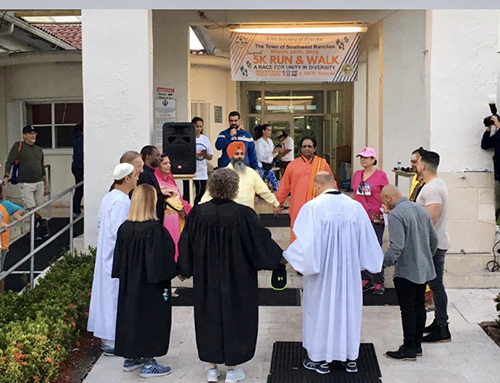 Leaders from 10 religious institutions in Southwest Ranches, including Archbishop McCarthy High, St. Mark Church and School, and the Archdiocese of Miami, take part in a unity prayer before the start of the 5K Run and Walk March 30. And they're off: Runners and walkers head out from the starting line at the Unity in Diversity 5K race held March 30 in Southwest Ranches. 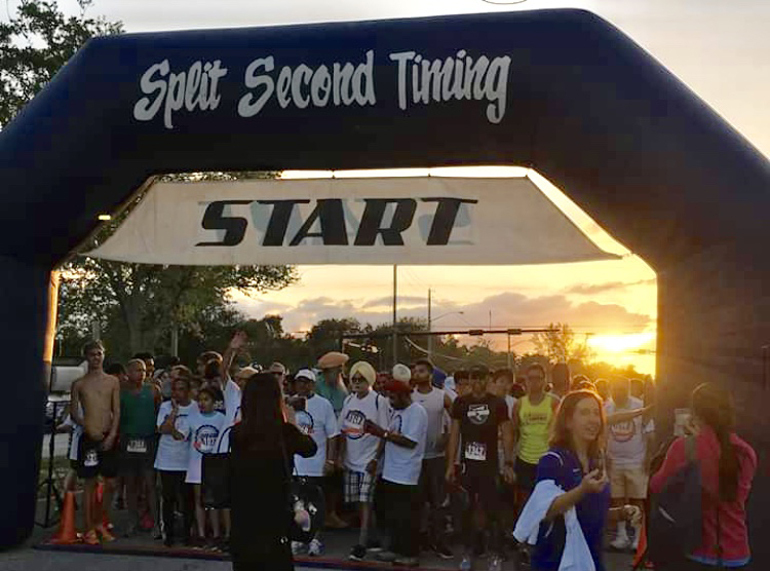 The meeting in the town of Southwest Ranches helped organize the town’s first “Unity in Diversity 5K Race,” held March 30, where participants proved that a community can literally walk and run together. Over 1,000 racers, volunteers and supporters from various organizations, schools, and faiths attended, raising about $10,000 for the Southwest Ranches town scholarship fund. “Today's youth recognizes that everyone is unique in their own way. However, we wanted to find common ground and shed light on what holds us all close together,” said Jashanpreet Singh, co-president of the Sikh Youth Association and a senior at West Broward High School in Pembroke Pines. 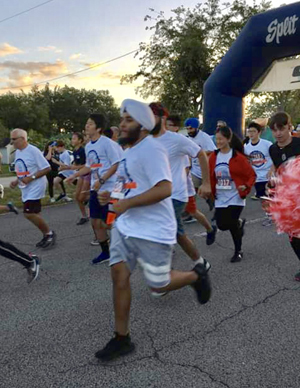 The Sikh Society of Florida and the town of Southwest Ranches partnered to raise funds for educational scholarships while promoting a healthy and active life style, explained Pavitpaul Singh, co-president of the Sikh Youth Association and a sophomore at American Heritage School in Plantation. But prior to race day, the Catholic community and several others were underrepresented. Nikolas Garcia, a junior at Archbishop Edward McCarthy High who is also founding president and member of the Sunshine Kids Club in Southwest Ranches, heard of the event and attended the planning meeting. But he knew that things had to change to include representatives of all faiths in the community, including his own. “We felt that this was important, especially since Southwest Ranches is known as ‘Church Row,’ as almost every faith imaginable has a church, temple, parish, mosque and synagogue on Flamingo and Griffin Roads,” Garcia said. Garcia and his mother went door-to-door to the various churches and temples to invite people to participate. As for his own Catholic community, Garcia presented the race idea to the McCarthy High faculty and administration, received approval, and recruited members of the student body. He also reached out to his alma mater, St. Mark the Evangelist School and Church, located next door to McCarthy High, and got them on board. Word even reached Father Patrick O’Neill, archdiocesan director of Ecumenical and Interfaith Relations, who came out on race day to support the effort. The result was a pre-race unity prayer led by the leaders of the various faith communities. Garcia said it was one of the most memorable moments of the whole day. Runner's at the ready: Participants of the Unity in Diversity 5K race eagerly await at the starting line.